Pilatus Aircraft, based in Stans, Switzerland, announced it had a record year for sales revenues in 2014. With revenues of CHF 1.174 billion (more than $1.2 billion), the company saw a 16 percent jump over 2013, which was also a strong year. distribution represents approximately half civilian and half air force customers. The military part of the business saw the greatest growth with a 22 percent increase over the previous year. But the general aviation sector was also strong. 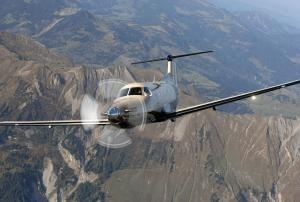 Pilatus delivered 66 PC-12NG turboprop singles, of which 50 went to the United States, and 10 PC-6 Porters. With the introduction of the PC-24, the business aviation segment of Pilatus could see a strong upturn in the next few years. The company took 84 deposits when it opened its order books for its first business jet at the European Business Aviation Convention and Expo in Geneva last spring. The company is hard at work in the development phase of the PC-24. First flight is expected to take place as soon as next month and Pilatus hopes to deliver the first PC-24 in 2017.